Anthony Sullo with a striped bass, big enough to feed the staff at Isola. 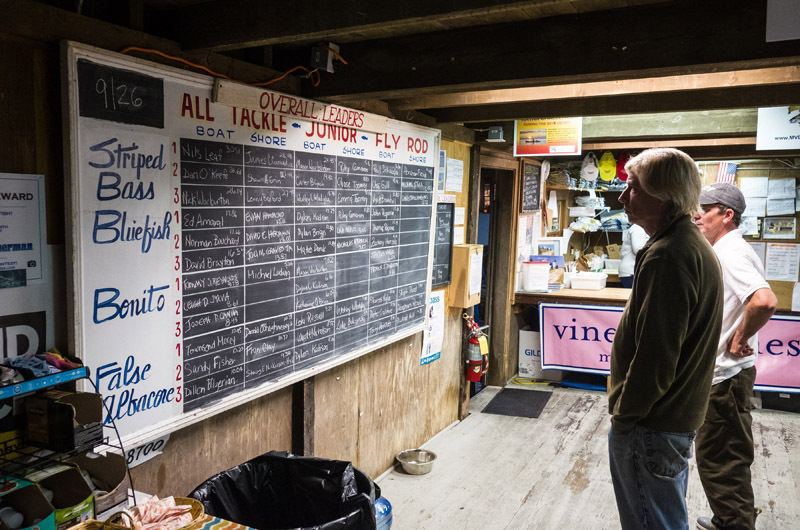 During the Striped Bass and Bluefish Derby, the Island is a fishing hub. Thousands of fish are caught, measured, weighed and filleted. 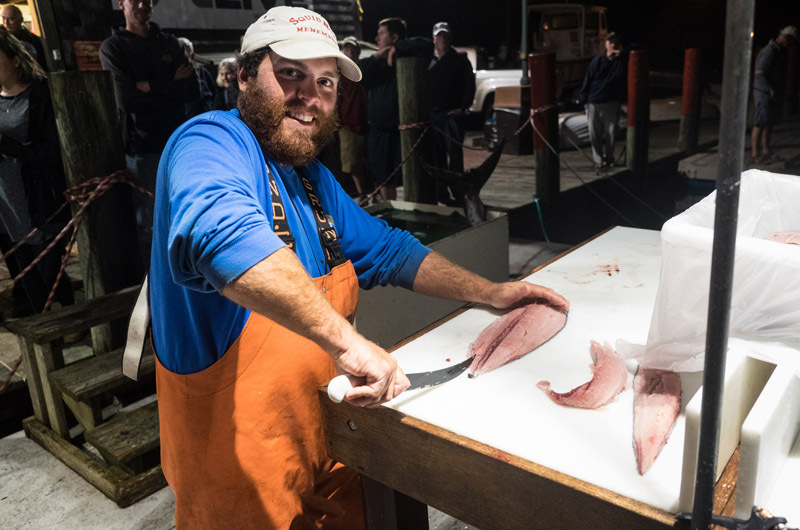 Though fishing spots are a jealously guarded secret, fishermen are more than willing to divulge their recipes and, on occasion, share their fillets. 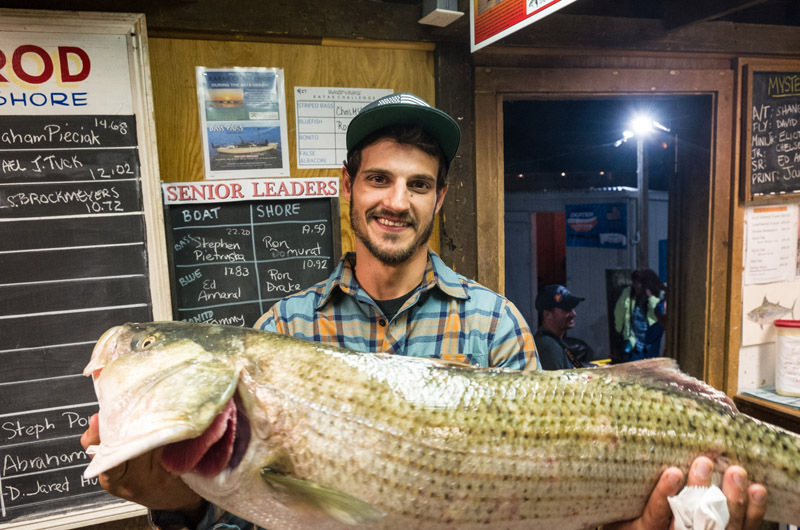 Recently, Anthony Sullo walked into the derby weigh station with a shore-caught striped bass. It weighed in at 17.46 pounds and 37.5 inches long. The fish was big enough to land him second place for the daily winners on Tuesday. It was also big enough to feed the crew at the Edgartown restaurant Isola, where Mr. Sullo works. “This is going to be the staff meal,” Mr. Sullo said. He prepares his bass simply, with just salt and pepper and cooked on the grill. “It’s delicious, a nice, white fish,” he said. If he’s baking the bass he’ll add olive oil, scallions and garlic. Some parts he likes to eat raw. “The cheeks on a big guy like this are delicious,” Mr. Sullo said, holding up his catch. 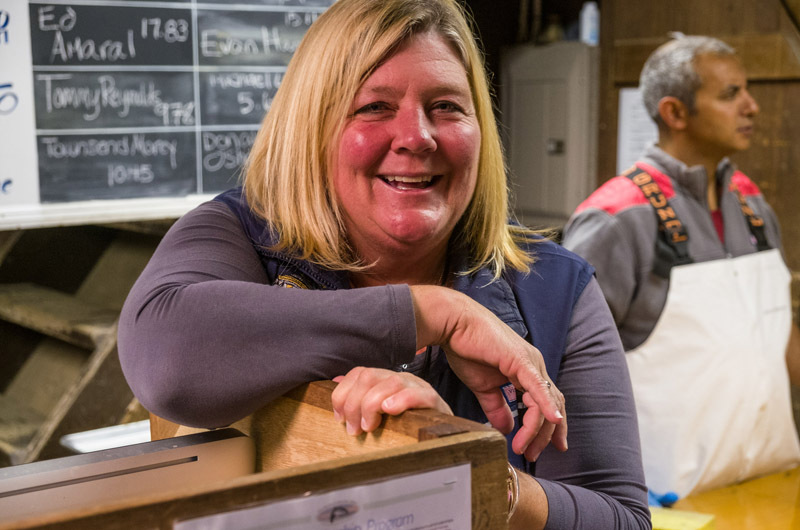 A lot of the fish caught is donated to the fillet program, which distributes the fresh fish to senior centers around the Island, but Ms. Coffey said occasionally someone will give her a fillet. “I always say oh no, go ahead and donate it, but in my head I’m thinking of which recipe to use,” she said. Outside headquarters, Eli Bonnell was holding court at the fillet station, where the donated fish go to be cut. Mr. Bonnell said he likes to fry striped bass bites. Creating the crunchy morsels is easy, he promised. Cut a fillet into one to two inch chunks, coat it in an egg wash and then coat it in bread crumbs. Deep fry the bites until the fish flakes and a fork goes straight through them. It’s the perfect warm snack on a chilly day out on the porch surrounded by friends, he said. For bluefish, he dresses it with lemon juice, chopped onions, chopped garlic, salt, pepper, two slices of butter and wrapped in tinfoil. He then grills it until it flakes (15 to 20 minutes) and serves it with steamed garlic asparagus and garlic mashed potatoes. “Garlic is key when cooking fish,” he said. Mr. Bonnell is keen to share, but he is also quick to take the middle section of a fillet. A lot of people will go for the thickest piece near the head, thinking they get more fish, he said, but the middle is really the best. Most derby fish seem to be shared. While standing on the wharf, Martha McAnulty was handed a just-filleted sliver of raw bonito. She ate it on the spot. “It melted in my mouth,” she said. Ms. McAnulty vacations on the Vineyard every year during the derby, even though she does not fish it herself. Musician Alex Karalekas has known the delicacy of raw bonito for years. He said he rolls it into nori rolls to share with friends, or makes sashimi with bonito, avocado and a toothpick. Though he doesn’t fish the derby himself, Mr. Karalekas takes friends out on his 15-foot boat. Recently, Leigh Sylvia caught an 8.6-pound bonito while out with Mr. Karalekas. As for soy sauce for the sushi? “Braggs Liquid Aminos goes better than Tamari,” he said. During a mid-morning break on Memorial Wharf, a group of derby fishermen congregated around a picnic table. Nothing seemed to be biting so Kathi Pogoda, Geoff Patterson and Ron McKee shared recipes for the fish they weren’t catching. “Everybody does it a little different. Usually we’re a little too busy to compare recipes,” Ms. Pogoda said. Mr. Patterson marinates false albacore with ginger, soy, sesame seeds and garlic. He’ll eat it baked or fried with a side of yellow summer squash with basil and onions. When Ms. Pogoda pointed out the stigma about false albacore, that it’s not a popular fish to eat, Mr. McKee suggested just keeping your mouth shut. “Don’t tell people what they are trying,” he recommended. Ms. Pogoda tends to cook fish given to her, while giving her own catches away, she said. Bob (Hawkeye) Jacobs, a beloved fisherman who died earlier this year, would always have a fillet of striped bass to share with her, she said. She likes to cut up the bass, put it on foil, add a slab of butter, load it with McCormick Grill Mates steak seasoning, wrap it up and bake at 400 degrees for 10 minutes (15 if it’s a thick cut). Mr. McKee, who has been fishing the derby for nearly 40 years, said the key to a good bluefish is to bleed the fish immediately. The best blues for eating (though they might not be a winner at the Derby) are between 16 and 24 inches, he said. He adds butter, garlic powder and fish spice to the fillets before flipping the fish three to four times on a hot pan until the skin breaks apart. “They just taste great,” he said, adding that he got the recipe from Hawkeye, 15 years ago. On occasion, the fish just looks too good and Mr. McKee cooks it right on the beach. “Cold beer, fresh cooked bluefish, you cannot beat it,” he said. His fish don’t always make it to the weigh station. “The first four fish of the derby all get eaten,” he said. Two words my Dad taught us early on in our partnered lives apply here, GOOD EATING.